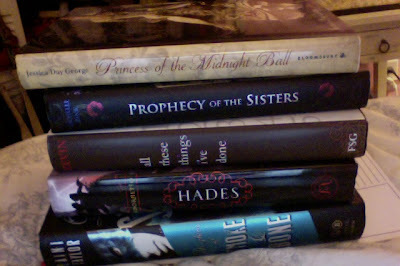 From your pile, I've only read Daughter of Smoke & Bone. But I've read it twice (which I don't normally do) and enjoyed it even more the second time. I'm actually not a big fan of Daughter of Smoke and Bone. The universe Taylor creates is pretty interesting, but the romance got a little too gushy for me :/ I don't know. It was still good though. All These Things I've Done and the Halo series are on my TBR list too so I suggest those! Well...I really liked Daughter of Smoke and bone!!! But anything like that is not appealing to me lately. I'll be interested to see what you think of Princess of the Midnight Ball. It's been on my TBR forever!! !